A spokesman for US forces in Baghdad has denied claims from the former Iraqi Information Minister, known as Comical Ali, that he was questioned by the Americans. Mohammed Said al-Sahhaf, famed for his deadpan insistence that Iraqi forces were crushing the invading Americans, has resurfaced for the first time since the collapse of the regime in April. In brief interviews on Al-Arabiya and Abu Dhabi TV on Thursday, he said that he had surrendered himself to US forces, who had released him after questioning. "Through some friends, I went to the Americans, to the people in charge, and an interview took place about a number of issues relating to my work," he said. "After the interview, I was released." But a spokesman for US forces in Iraq said they had never questioned Mr Sahhaf, let alone had him to release. US Central Command was also unable to confirm his claims, telling BBC News Online: "He is an interesting story teller and we look forward to hearing what he has got to say." Mr Sahhaf is not on the US list of 55 most wanted Iraqis. Looking thinner and greyer than three months ago during his daily press briefings, he declined to tell the Arab TV stations about the final days before Baghdad fell. "The time is not yet ripe to say what happened. When history's ready, then we can talk about it," he said. 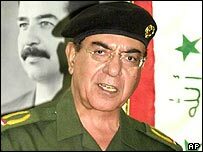 He refused to retract his wartime claims that Iraqi forces were "burning the Americans in their tanks", saying only that his reports came from "authentic sources - many authentic sources". "The military part of our information network - which we were accustomed to rely on for exact information - was the first part of the network to fall apart," he said. "It did suffer and it became very weak, while the reporters from Iraqi radio and television stations were more active and had more accurate information. "It was unworthy of our military sources that they were the first to weaken." Mr Sahhaf said the war was "a difficult situation, not for one individual, but for everybody". He denied being part of Saddam Hussein's inner circle, saying he was a professional doing his job. And he said he was at work on a book. His comments were part of a longer interview due to be broadcast on Friday at 1900 GMT, Dubai-based Al-Arabiya TV said in a statement. Mr Sahhaf's daily press briefings in Baghdad during the war, at which his statements were increasingly at odds with reality, made him a figure of fun in the West. He was dubbed "Saddam's optimist" and "Comical Ali" by media commentators, before disappearing as American forces entered central Baghdad. But he gained a wide following for his way with words; a website devoted to him crashed on launch when it was overloaded by thousands of people per second trying to log on. 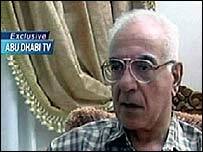 Even George W Bush admitted to being something of a fan, telling the US television station NBC that Mr Sahhaf was "great". Iraqis themselves had mixed views about their president's Information Minister. One woman told the BBC: "We used to sympathize with him very much. We had high hopes that it would not happen the way it did, but what can we do?" An Iraqi man asked: "The main point is, why did the Americans release him? He used to talk against them and against their information and described them with very improper words. "He used to describe them with words like 'al-Illouch' (infidels) and many other rude words. There was a lot of misinformation (from Sahhaf), why didn't they keep him with other prisoners?" In April, a London-based Arabic newspaper ran a story saying Mr Sahhaf was attempting to surrender to US forces in Iraq. But Al-Sharq al-Awsat said the Americans were refusing to arrest Mr Sahhaf because he did not appear on their "most wanted" list. An Iraqi Kurdish official told the newspaper that Mr Sahhaf was staying at his aunt's house in Baghdad, and was under surveillance by US forces. He said the former minister was still trying to negotiate his arrest, fearing for his safety in the Iraqi capital. "The information minister who was actually a disinformation minister"